Departing Shearwater we motored about 45 minutes into Lama Passage and then set sail. It was SW 15-20 in Hecate today, but as Lama passage veered east that meant we had a sweet downwind sail. More great sailing! This is what PNW sailing is all about to us. As Lama Passage joined Fisher Channel we hit a wind lull, but were able to drift into Fisher Channel where there was 18-20 from the south. We beam reached across the channel to the Codville Lagoon entrance. 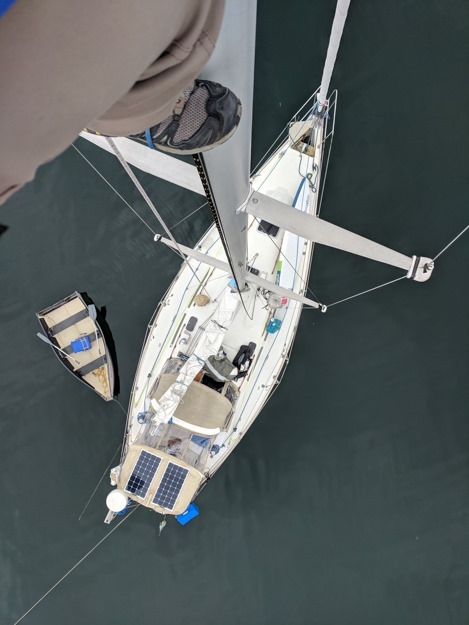 With full sails up we were way overpowered for a beam reach, but since it was only 2 nautical miles we decided to just ride it out, hitting 7.5 knots with a full 1/4 turn of weather helm. This is not what we would normally do, but since it would only be 15 minutes it wasn’t worth reefing. We sailed through the narrow entrance and arrived into a calm, scenic anchorage. Seven other boats were here, which is the most we’ve shared an anchorage with since setting sail 2 1/2 months ago! We were happy to see some boats though, and it made it feel like summer is really here. We hiked up to Sagar Lake, only a 15-minute hike away. Sagar Lake was beautiful and has a sand beach with a gently sloping seabed and clear water. We both agreed it’s the best forest lake we’ve ever been to. 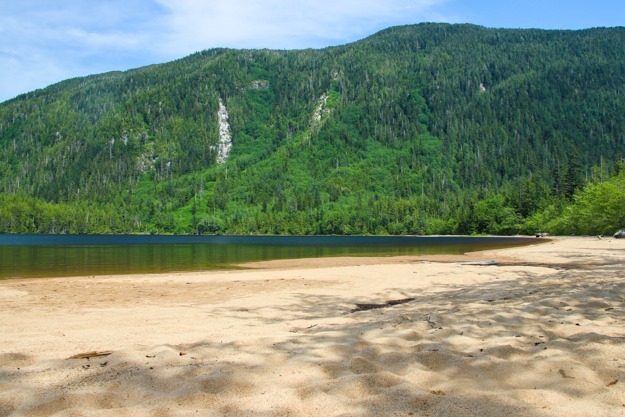 Most lakes in the PNW have densely forested, rocky shorelines – a sand beach shoreline is something I’ve never really seen here before. 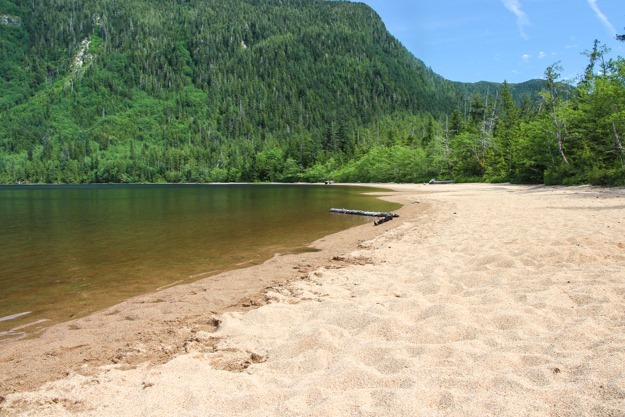 And most lakes are difficult to swim in, having boulders and log debris near the shore. Once in the lake there’s usually 6 inches of squishy muck on the bottom from decaying trees and moss, and mosquitoes breeding nearby hungry for a meal. Sagar Lake was none of those things. Pretty much the best lake we’ve ever been to. After Codville Lagoon we sailed down to Pruth on Calvert Island for 4 days. 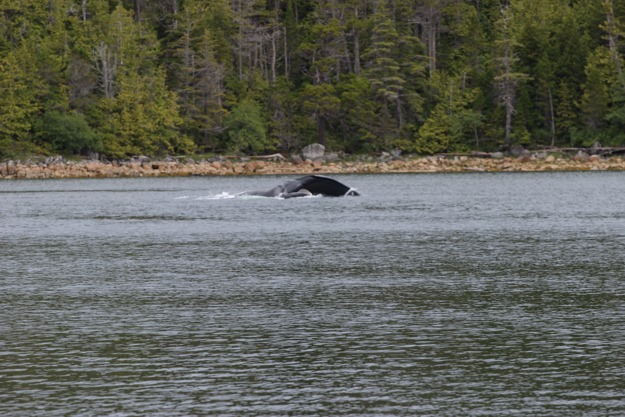 We saw 3 humpbacks on the way and spotted a Race to Alaska boat. They were on the other side of Fisher Channel, and all I could see with the binoculars was a light blue hull, a black spinnaker and a white mainsail. But I knew it was probably an R2AK boat because they’re the only ones likely to be sailing a small boat up here, and flying a spinnaker. Later, on the Pruth Bay wifi, I checked the R2AK tracker and discovered it was Team Wild Card, and they were in third place! I had a lot of fun following the R2AK competitors over the next few days. 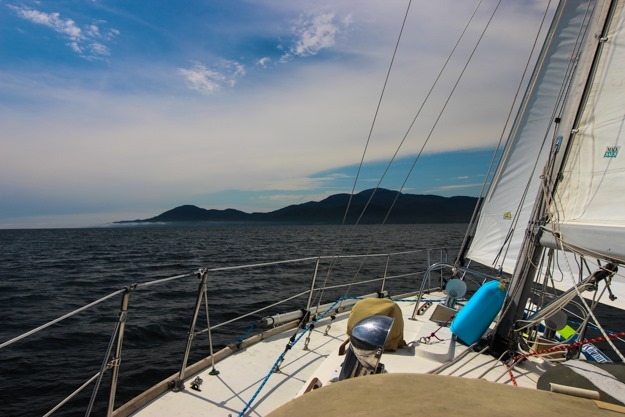 It felt like we had a front row seat because they were starting to pass by Calvert Island – we spotted two more from our anchorage. 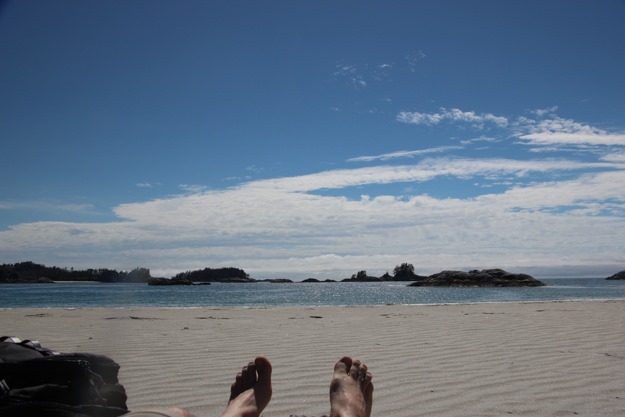 We’ve written about Pruth Bay before, so I’ll just let the pictures do the talking. 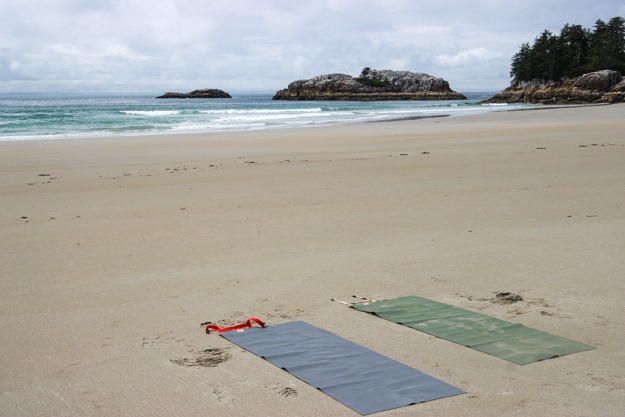 Yoga on the beach with our YOGO travel mats (Amazon link) – very convenient mats for the beach, hiking and travel. As I paddleboarded around the inner lagoon of Kwakume Inlet in the morning, everything was still and silent but for an occasional loon calling. An eagle sat in a tree-top overhead watching me, and a seal followed. There was no trace of human presence, just untouched evergreens dripping with moss. 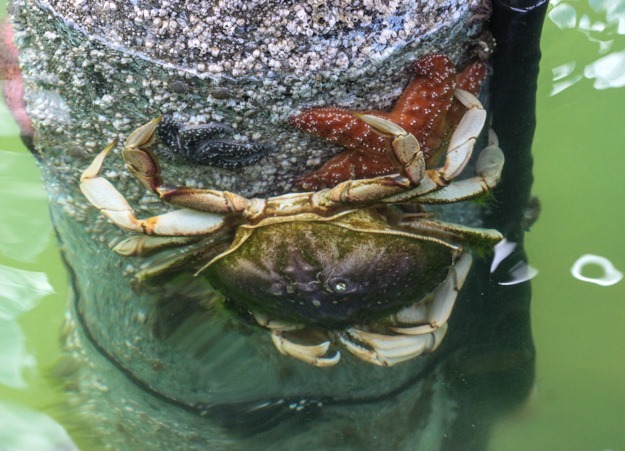 The sea bed below me was vibrant with purple, red and orange sea stars and dozens of red crabs. 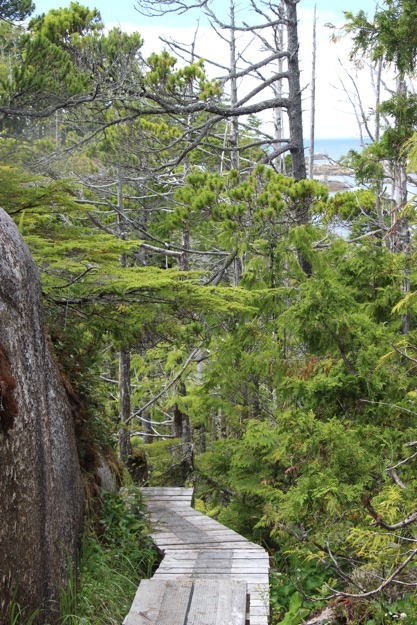 A place like this is a reminder of the wild, pure beauty of British Columbia. No Internet, no plastics, no garbage, no exhaust fumes; just nature. 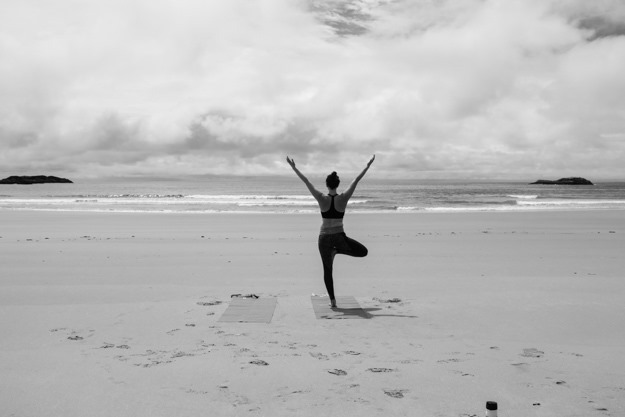 Kwakume Inlet was nothing particularly remarkable – what was most remarkable was its averageness. 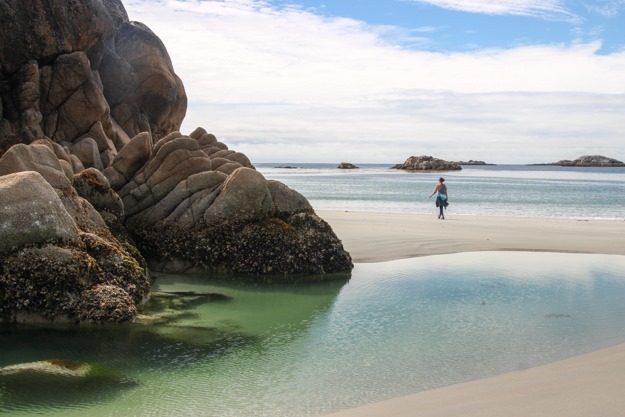 The fact that a place like this is commonplace on the Central Coast of BC puts into perspective how lucky we are to have this. After a restful night in Kwakume Inlet, we headed to Fury Cove for a night, as our jumping off point for going around Cape Caution. Climbing the mast to do a rig inspection. Our first rounding of Cape Caution was windless and mostly motoring into 3-6 foot swell. This time around, heading southbound, we still had the 3-6 foot swell but just enough wind to sail downwind. With 7 – 12 knots from the northwest we were able to sail most of the way, making for a more enjoyable day. It was a long day, 8:30am – 6pm, sailing 50 nautical miles to go 30 miles as the motorboat travels. But it was a lot more fun than motoring through that swell. As we sailed into the bay outside Miles Inlet we noticed a very small boat that looked like a kayak with pontoons and two small sails up, heading our way. Another R2AK boat! It turned out to be Joe from Kairos, and after he anchored in the channel nook of Miles Inlet I paddleboarded over to chat and bring him a beer. He’s from Connecticut, and has never sailed these waters before – it’s really inspiring that the R2AK racers are able to go so far with such small, minimalist boats. I think the Central Coast has to be my favorite coast of BC. We’ve had day after day of great sailing, protected anchorages, and beautiful beaches. 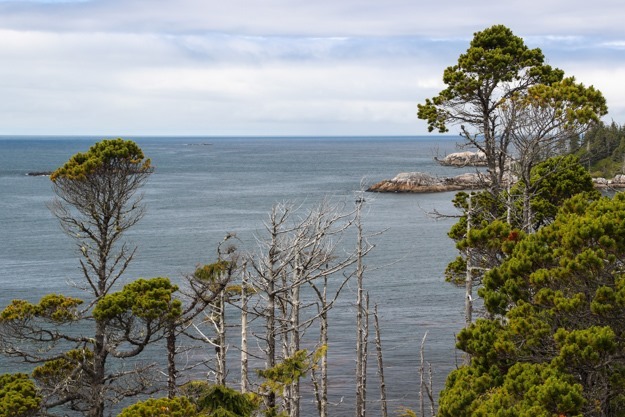 The trees on shore remind me of Cape Cod – a mix of arid, scraggly evergreens amongst some wetter weather vegetation. It was hard to say goodbye to the Central Coast, but we know we’ll be back. Next we’re reprovisioning in Port McNeill and heading south through Johnstone Strait to Campbell River. Humpbacks in the channel as we were exiting Pruth Bay. 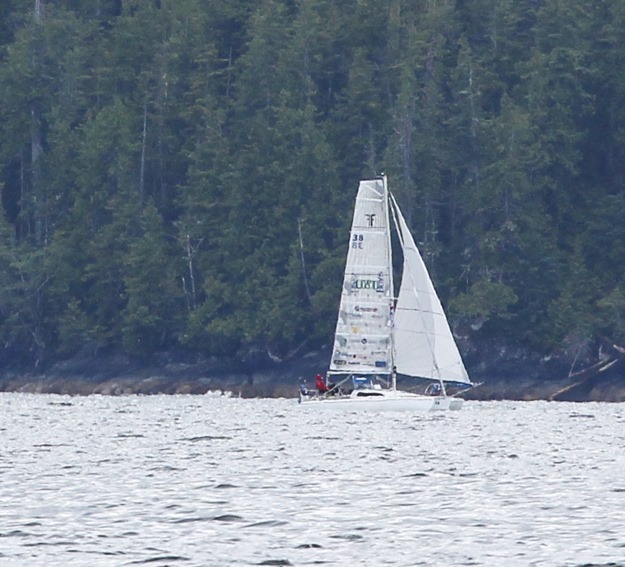 R2AK team “Lost Boys” sailing up Fitz Hugh Sound. And to describe the wilderness around you. One question. From your masthead shot I see your Portabote. What size? Do you ever tow? Quick recommendation? It’s the 10 foot Portabote. It tows well and that’s our normal mode of travel. We disassemble and stow it inside the shrouds on deck mainly for straits where we might get more than 20 knots of wind or more than 2 foot waves (Johnstone, Juan de Fuca, etc). Every dinghy is a compromise but overall we’re pretty happy with it.